As the year 2018 draws to a close, you might think phonemakers would catch a break before the start of the new year. However, that doesn’t seem to be the case, as we’re seeing loaded smartphones being launched in the last weeks of the year as well. In fact, the month gone by saw the launch of the Huawei Mate 20 Pro (review) and Redmi Note 6 Pro. So if you were wondering which devices spiked user interest in the month of November, you’re at the right place. As you can guess, this list isn’t reflective of sales of the respective handsets, but it does serve as a good indicator of which devices caught consumers’ attention the most. Staying true to the legacy of its predecessors, Xiaomi’s Redmi Note 6 Pro made a stunning debut in the list at the top spot. 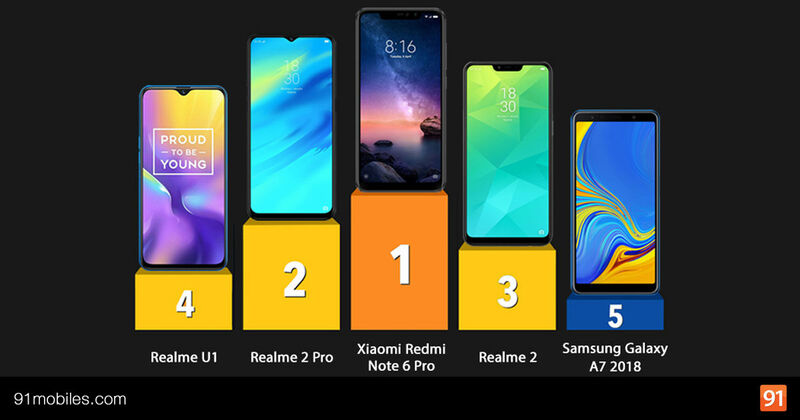 What’s even more surprising is the fact that Realme, which has only been around for a few months, has not one, but three of its devices among the chart-toppers. At the fifth place sits the triple camera-toting Samsung Galaxy A7 (review), which has jumped three spots from last time. 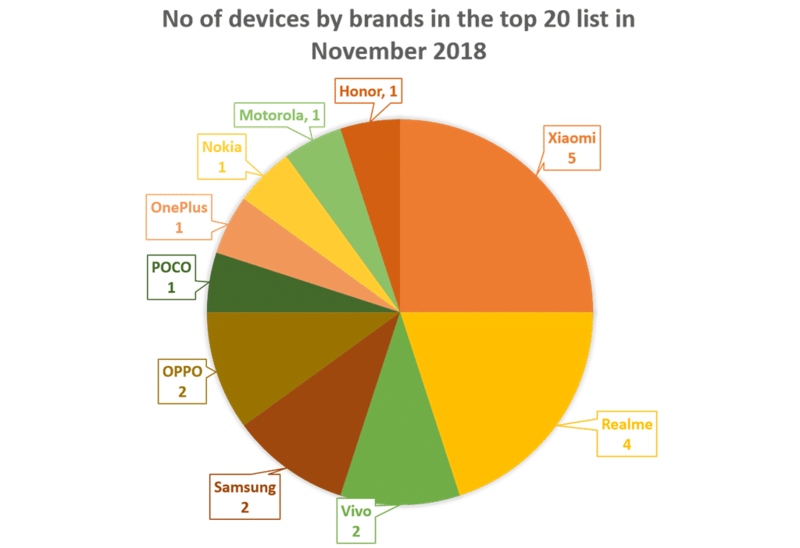 Even though the top five smartphones in the month of November went through quite a shuffle, the rest of the list is largely the same as the top 20 phones in October, apart from showing a dip in popularity levels. So without further ado, let’s take a look at the complete chart, wherein mentioned alongside the smartphones is the change in ranking from the previous month, alongside the price band and the month of launch in India. Thanks to the Redmi Note 6 Pro (review), Xiaomi has bagged the first spot in the list of the top 20 phones after quite a while. While the brand relegated its position to the likes of Realme and Samsung, the Note 6 Pro is a worthy device to reclaim the throne as it comes with quad cameras – two at the rear and two at front, along with a notch-toting display, while continuing with the specs that made its predecessor a powerful budget offering. The U1 (review) marks the debut of a new U series of smartphones from Realme which is aimed at photography enthusiasts. To that measure, the handset comes with dual rear cameras and a powerful 20-megapixel shooter up front. That’s not all, the Realme U1 is also the most affordable smartphone with a dewdrop notch, which ensures a high screen-to-body ratio. The POCO F1 (review) is the most affordable device in the subcontinent that comes equipped with the top-of-the-line Snapdragon 845 SoC. What’s even more interesting is that it has got a price cut recently, bringing down the cost of the base model to below Rs 20k. Along with the powerful chipset, the F1 doesn’t compromise on any aspect either, be it cameras or battery. While Xiaomi continues to dominate the list of the top 20 smartphones, it’s Realme that has shown an impressive run ever since its inception. The brand debuted in May this year and out of its five smartphones, four have been able to find a place among the most popular phones. Vivo, Samsung and OPPO trail with two devices each. All the other phonemakers have just one handset each in the list. Another interesting trend that can be seen is that more and more phones with beefy batteries are grabbing consumer attention. In fact, in the month of November, barring three phones, all smartphones were fuelled by 3,000mAh+ cells. That’s not all, as many as eight handsets sip juice from 4,000mAh batteries or more. With just the last month remaining before the beginning of the new year, we have to wait and watch if December throws any surprises. So make sure to come back and see which were the most popular phones in the month of December.